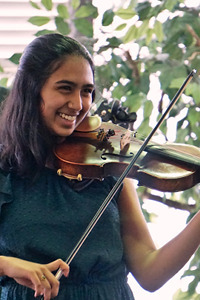 In August of 1994, Bob Phillips, the orchestra director at Saline High School, approached some of his string musicians with the idea of forming an extra-curricular group with these primary goals: to learn traditional American fiddle music, to perform it for small audiences, and thus help to perpetuate this rich, musical heritage. Bob believed that creating such a new program for high school students would greatly enhance their music education and their interest in musical performance. He envisioned the program being one that would allow them to continue their classical music studies as a part of their high school curriculum but also give them the opportunity to use their own time to discover, master and perform a different style of music that has its roots in Saline’s rural heritage as well as our country’s history. 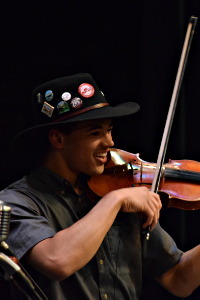 The response to Bob’s invitation from 22 “founding fiddlers” was immediate and so positive that a uniquely student driven musical ensemble, the Saline Fiddlers Philharmonic, was born. The group flourished under the leadership of Bob and his wife Pam Phillips for the next eight years. The repertoire of the group, the size of the audiences, the distances traveled for performances, and the reputation of the group grew exponentially during this time. 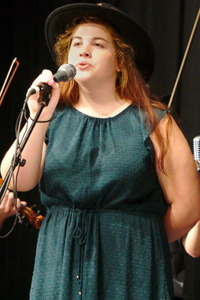 Many fine singing voices were introduced and the ever-popular Fiddler Cloggers, under the direction of choreographer Sheila Graziano, were added to their shows. Upon the Phillips’ retirement in July of 2002, leadership of the group passed to Ben Culver, an alumnus of the group. 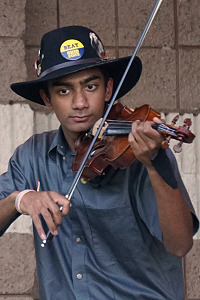 In 2014, Saline’s two youth fiddling groups were reunified and celebrated their merger by returning to the name Saline Fiddlers Philharmonic. 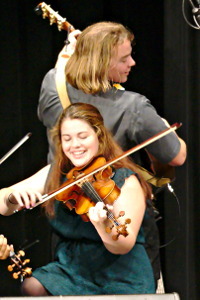 One of their first performances together was at the “Hat’s Off to Bob and Pam Phillips” concert which was a well deserved tribute to the two people who initiated Saline’s tremendous fiddling tradition. 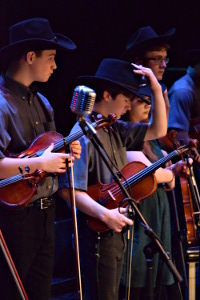 What an amazing group of young people … In a season of Grammy Award winning performers being on stage at our Opera House, the Fiddlers were my favorite bar none! What’s not to love about a stage full of talented kids doing what they love!! Our audience loved the Saline Fiddlers!! I enjoyed watching young people enjoy music, and working together doing something very positive. Despite the call of the great carnival rides, our family stayed for your entire performance at the Saline Fair last Saturday. You were FANTASTIC! We will definitely try to attend ALL your local events!! I had the privilege of attending your concert in Battle Creek last Sunday. Believe me, I was impressed beyond words with the amazing talent and total rapport with the audience!!! A friend of mine sent me your website and I’ve been addicted to your videos all day! I’m an orchestra teacher in Connecticut and I’ve been wanting to start a fiddle group for awhile — you’ve really inspired me! So many young and very talented musicians. It was a joy to listen to them. And, so invigorating! Talk about the healing power of music! Wow, what a great bunch of performers. Your hard work and talent certainly shows. I especially enjoyed the time some of the performers spent talking with my daughter after the show … Thank you for a wonderful experience! We were so pleased to have the Saline Fiddlers Philharmonic this summer. It was such a great opportunity for our small island community to see a group of young people with such talent! We actually featured them on our calendar this year.